The match will apply to donations made from now through January 31, 2017. The building will house a precious golden stupa containing a portion of Shamar Rinpoche's relics— one of the few such reliquaries in the world, and the only one thus far in the U.S. and Canada. The golden stupa is already complete and will be shipped from France once we are ready to receive it. 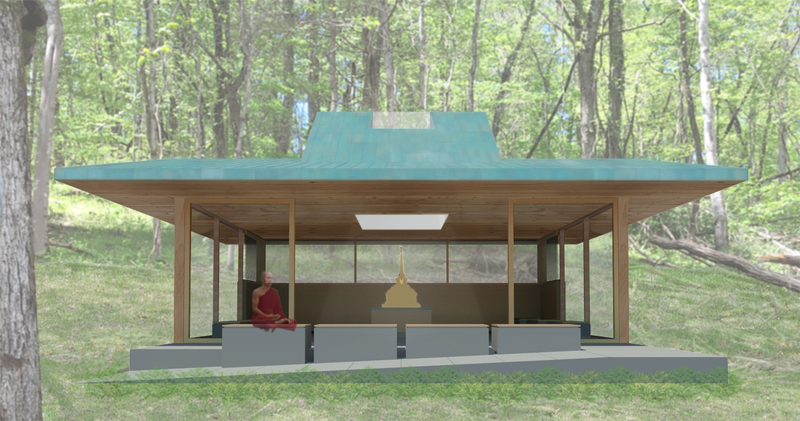 A site has been chosen for the reliquary building on what Rinpoche referred to as "Buddha Hill," near the current timber-framed Buddha Shelter. Visitors can follow landscaped paths to visit the reliquary stupa site and the shelter. See the retreat center website for more photos. Your donations will have twice the impact by helping us meet the matching donation. For more information, you may also download a PDF letter. Thank you to all who have supported Bodhi Path over the years and become part of our community. So many have contributed so much to support Rinpoche's vision of creating Dharma centers that are accessible and friendly. This matching campaign is one more way to support the Dharma. Any and all contributions are valuable. May they benefit all beings.